Popheaval: Happy Independence Day, Finland! The Maiden of Finland is a grand old lady now, turning 96 and all! Incidentally, this is my 96th blog post. How coincidental (and not at all deliberate) is that! 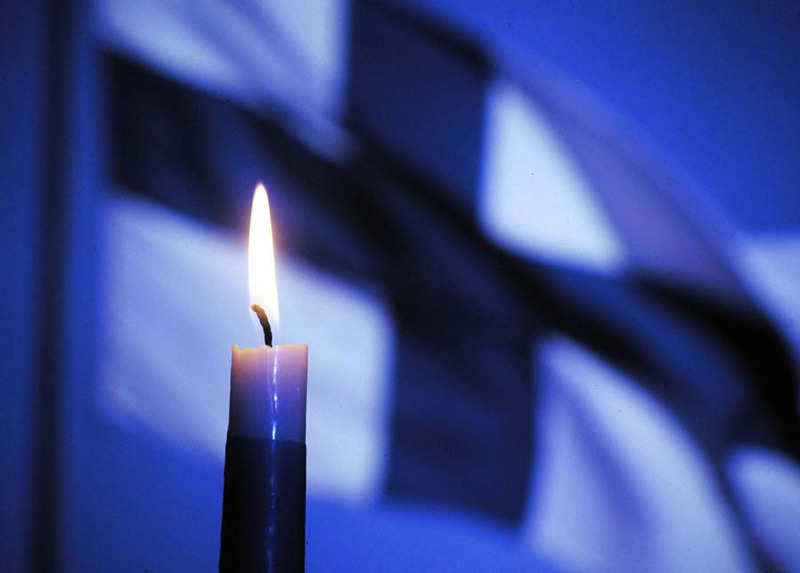 Now, the chances are if you're from outside of Finland, you don't know much about the Finnish Independence Day (and why should you, come to that). Unlike in the States, for example, where their respective Independence Day is celebrated with spectacular fireworks and other festive things and where a majority of my readers come from, in Finland the day is a rather solemn one. Being a national holiday, people tend to stay home and spend time with their families and friends, lighting blue and white candles, perhaps having a festive dinner together and watching TV. One reason for the solemnity and the lack of merry festivities is probably the fact that while Finland did get its independency in peaceful circumstances, the country has had to defend that independency on many occasions, and defending it has often been costly. Finland's participation in World War II is a prime example. There's actually a black-and-white movie called The Unknown Soldier (1955), that's based on a novel of the same name, that tells the story of the Continuation War between Finland and the then-existing Soviet Union, and the movie is a traditional must-see for Finns every Independence Day. The movie, perhaps due to its significance in the canon of the Finnish myth, is in fact the most-viewed Finnish film of all time. Another and a considerably more lighthearted must-see is the 'Castle Ball', where the president hosts a big reception at the Presidential Palace for 2,000 people, including the parliament, previous presidents and prime ministers, generals, diplomats and distinguished celebrities such as actors, musicians and athletes, among others. Highlights include collectively judging all the women's dresses from your own sofa (seriously, the next day the papers publish like, extensive articles on the subject) and watching the presidential couple begin the first dance, traditionally a waltz danced to "The Blue Danube" by Johann Strauss II. Some of the afterparties are also televised so you even get a chance to snigger at tipsy celebs. But enough of culture and history, this is a music blog, right? And considering I'm a Finn myself so you'd probably expect me to use the opportunity to promote some Finnish music, but I won't do that, tempting as it is - wouldn't that be just a tad too easy? Instead, I'll leave you with the following song. It's not Finnish, even though the name of the song is indeed "Finland", but it's actually by the English musician/producer YILA who makes up 50% of the exciting jazzy glitch-pop duo Aloosh. The song appears on his unfinished and officially unreleased album (that can still be listened to and downloaded for free on his Soundcloud page). For some reason, whenever I'm feeling a bit homesick, it is this song that I turn to for instant relief. I don't know the story behind the song but to me, the song captures the country and its spirit in a wonderful way and, might I say, better than many Finnish acts do. So there you go. I like my country like I like my music - independent. All you Finns and Finland-minded, hyvää itsenäisyyspäivää! Why, thank you! : > It's always great to get actual feedback - especially positive one - and it always makes my day!